In this trilogy of horror-themed Halloween stories, Bart and Lisa attempt to scare each other with tales of the macabre. 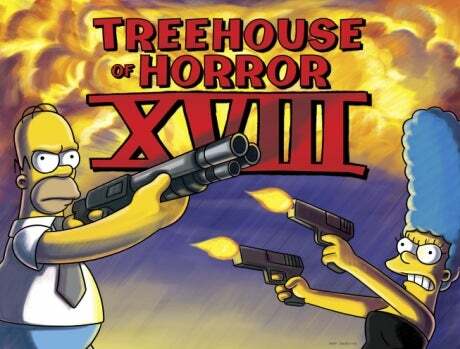 In first,"Bad Dream House", the Simpsons inhabit a haunted home, which possesses their souls, and causes them to attempt to kill each other. But after spending enough time with the Simpsons, it is the house, which kill itself, vanishing into another dimension. In the second segment, "Hungry are the Damned", the Simpsons accuse the monsters of planning to eat them, but the offended aliens reveal they were only planning a sumptuous meal for the family. In the third segment, a satire of Poe's "The Raven", a grief-stricken Homer is tormented by bad bird Bart. The Simpson family receives a severed monkey's paw which can grant wishes, Bart gains magical powers which he uses to turn Homer into a Jack-in-the-box, and Mr. Burns uses Homer's brain to create a robot. In "Clown Without Pity", a Krusty the Clown doll goes berserk in the Simpson home. In "King Homer", Marge is wooed by a giant ape. And final story, In "Dial 'Z' for Zombies", Bart's attempt to bring back the family cat turns the town of Springfield into a pack of bloodthirsty zombies. 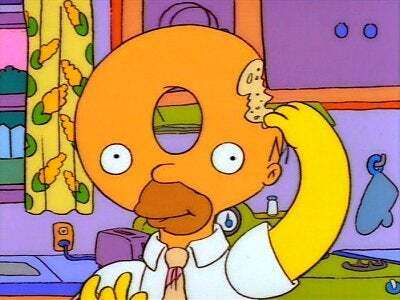 When Homer announces he would sell his soul for a donut, the Devil, disguised as Ned Flanders, shows up to take him up on the offer. Second Act, while ridings to school, Bart believe he sees a malevolent gremlin on the side of the bus. And final act, Mr. Burns is Dracula, in a spoof of Francis Ford Coppola's vampire film. The Simpsons are employed on Mr. Burns's country estate-and Homer goes insane. And act two, Homer's attempt to repair a toaster lead him repeatedly back into the past-and he inadvertently changes the future. And the final act, the school cafeteria turn to an unusual source of food-and schoolchildren start mysteriously disappearing. First, a freak lightning storm causes giant advertising mascots to come to life. Next, Groundskeeper Willie dies and swears revenge on the kids in their dreams. Finally, Homer accidentally finds himself trapped in another dimension. Bart discovers his Siamese twin Hugo in the attic. Then, Lisa becomes a god after she accidentally creates life in a science fair project. Finally, Kang and Kodos plot to conquer the planet disguised as Bill Clinton and Bob Dole. 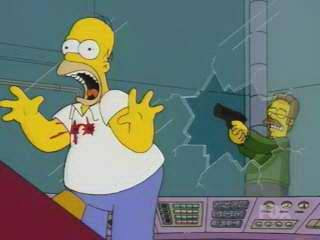 In "The Homega Man," Homer battles mutants after Springfield is annihilated by a neutron bomb. Then, Bart has his DNA mixed with a fly in "Fly vs. Fly." Finally, Marge is revealed to be a witch in colonial Springfield in "Easy Bake Coven." Homer receives an evil hair transplant in "Hell Toupee." Then, Bart and Lisa get trapped in an Itchy and Scratchy cartoon in "The Terror Of Tiny Toon." Finally, Maggie is revealed to be an alien in "Starship Poopers." The Simpsons attempt to cover up their accidental murder of Ned Flanders in "I Know What You Did-Iddly-Did." Then, Bart and Lisa become superheroes and save Lucy Lawless from the evil Collector in "Desperately Xeeking Xena." Finally, Homer's incompetence causes a Y2K apocalypse in "Life's A Glitch, Then You Die." Homer must do one good deed to get into Heaven in "G-G-Ghost D-D-Dad." Then, Bart and Lisa encounter a witch in a gingerbread house in "Scary Tales Can Come True." Finally, super-intelligent dolphins strike back at humanity in "Night Of The Dolphin." A gypsy puts a curse on Homer in "Hex In The City." Then, The Simpsons' new automated house malfunctions and tries to kill Homer. Finally, Bart and Lisa attend a school for wizards in "Wiz Kids." First, Homer uses a magic hammock to clone himself in "Send In The Clones." Then, gun-wielding zombies attack Springfield after a ban on firearms in "The Right To Creep And Scare Harms." Finally, The Simpsons are trapped on an island where people are transformed into animals in "The Island Of Dr. Hibbert." In "Reaper Madness", Homer kills the Grim Reaper to protect Bart, but becomes the new Grim Reaper himself. In "Frinkenstein", Professor Frink tries to revive his dead father so he can see his son winning the Nobel Prize. The last story is "Stop the World, I Want to Goof Off", in which Bart and Milhouse finds a stopwatch which can stop time, but soon the whole city is chasing them. In "The Ned Zone," Ned gets the ability to tell people's deaths just by touching someone. In "In the Belly of the Boss," Mr. Burns accidentally swallows Maggie and the Simpsons try to get her out. In "Four Beheadings and a Funeral," Lisa and Bart try to solve the mystery of the mutton-chops murderer. In "B.I. : Bartificial Intelligence", the family replaces Bart, who is in coma, with a robot son, but when Bart wakes up he wants revenge on the robot. In "Survival of the Fattest", Mr Burns invites many of the townspeople to go hunting, but Mr Burns plans hunting the townspeople. In the end Homer is the last one alive, but for how long? In "I've Grown a Costume on Your Face", a witch turns everyone in Springfield into their costumed characters, and Maggie, being dressed as a witch and therefore becoming a witch herself, is the only one who can break the spell. "Married to the Blob" - a take-off on The Blob, with Homer in the title role as radiation from a meteor turns him into a blob-like monster. "You Got to Know When to Golem" - A take-off on an old Jewish legend. "The Day the Earth Looked Stupid" - in the late 1930s, Kang and Kodos land in Springfield as part of an alien invasion, but the town, completely taken in by The War of the Worlds, doesn't pay much attention. The Simpsons' 19th Halloween Special, with parodies of "Transformers," "Mad Men," and "It's the Great Pumpkin, Charlie Brown." Lisa becomes livid with Miss Hoover, and in a series of homages to classic Hitchcock sets out for deadly revenge. Next, Krusty's latest fast-food sandwich transforms news anchor Kent Brockman into an enraged zombie and twenty-eight days later, cannibal zombies have overrun Springfield. In the final frightening fable, Homer accidentally falls through a trapdoor in Moe's tavern and impales himself on the pipes of Moe's microbrewery. Moe serves the barflies a glass of delicious beer flavored with Homer's blood and Homer, now half-man, half-brewing apparatus, returns for vengeance.